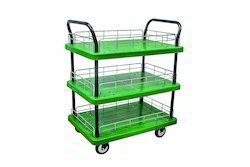 Leading Manufacturer of big basket trolley and basket trolley from Mumbai. 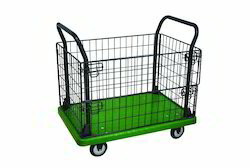 Being a highly effective, lean and fast-moving organization, we are widely instrumental in manufacturing and exporting an extensive range of Big Basket Trolley. We offer this trolley with durable basket which is fabricated for carrying light weight articles like plastic products as well as fruits and vegetables. This trolley is available in various attractive designs, colors and is easy to handle and carry. Offered at industry leading prices, this big basket trolley is in a huge demand in the stores, shopping malls and other commercial places. Looking for Basket Trolly ?